As an extension of the exhibition Anticorps Antoine d’Agata held at the BAL (January-March 2013), the coordinators of Actes, une présence politique, in collaboration with the photographer, wanted to continue to assert the political dimension – too rarely taken into consideration – the photographic Antoine d’Agata work has, by incorporating and expanding in various scriptural and graphic forms, making it leave the jurisdictions in which it has often been assigned. 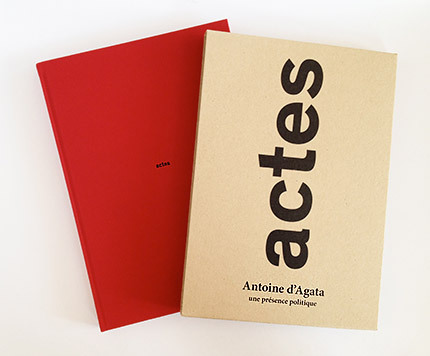 Actes, une présence politique is organized into five parts, as a plural space offered to the reader-viewer so he can continue to see and think the work of Antoine d’Agata, the photographer whose artistic gesture and movement life is bound in an eminently political purpose. The first chapter is a collection of political pamphlets and images found on the ground floor of the exhibition. The political side is thus demonstrated graphically. The second chapter is an echo to the installation created on the ground floor of the exhibition with the voices of women. 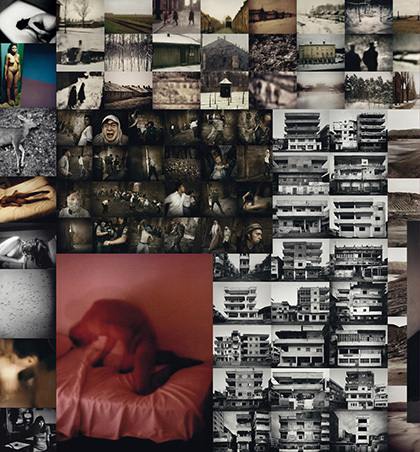 The third chapter shows images from the photographer in connection with the installation at the basement of the exhibition. The fourth chapter contains some of the interventions that took place during the exhibition and includes contributions from authors in distinct fields (philosophy, literature, photography, anthropology, cinema, and aesthetics). The plurality of approaches covered opens up a range of looks that allows the reader to browse with the authors the different storylines and build its own look. The fifth chapter describes the theme of the exhibition, then attempts to give a provisional form, to show a truth, to install the visitor in a lifetime experience, in a work, a world. Immersion, submersion, engulfment. 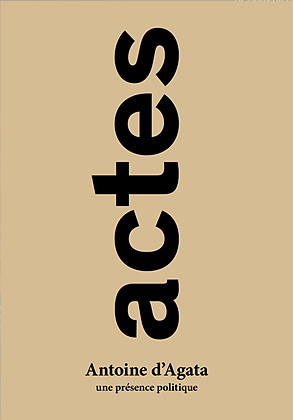 Actes, une présence politique by Antoine d’Agata has received support from Cnap (editorial assistance), the Olympus Corporation and the Université Ouverte du Sujet dans la Cité.